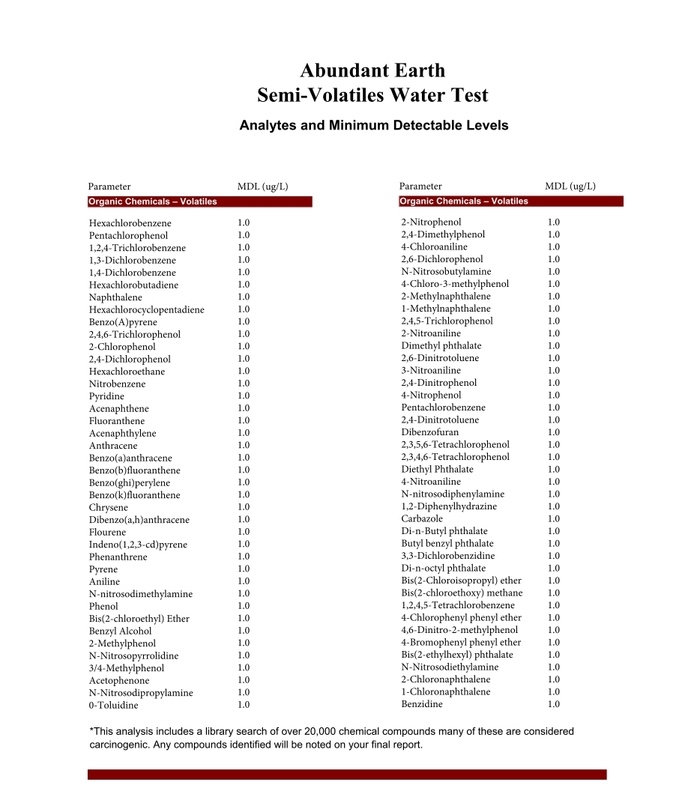 Your Comprehensive Water Test Kit for Well Water analyzes for over 100 items including Bacteria (presence/absence for total Coliform and E.Coli), 19 heavy metals and minerals (including lead, arsenic, and mercury), 11 other inorganic chemicals (including nitrates, fluoride and more) and physical factors (including pH, total dissolved solids, hardness and more), 4 disinfection by-products (trihalomethanes), 47 volatile organic chemicals (including MTBE, PCE and TCE) and 20 pesticides, herbicides and PCBs (including Dieldrin, Atrazine and Heptachlor). This is an excellent package for anyone who has never tested their well water or who has not tested in several years and are concerned about potential pesticide contamination. This is a comprehensive water test and is useful in determining if a treatment system is needed. Your Comprehensive Water Test Kit for City Water analyzes for over 100 items including 20 heavy metals and minerals (including lead, arsenic, and mercury), 11 other inorganic chemicals (including nitrates, fluoride and more) and physical factors (including pH, Total Dissolved Solids and Hardness), 16 disinfection by-products (including chlorine, chloramines, trihalomethanes, haloacetic acids and more), 47 volatile organic chemicals (including MTBE, PCE and TCE) and 20 pesticides, herbicides and PCBs (including Dieldrin, Atrazine and Heptachlor). This is an excellent package for anyone who has never tested their well water or who has not tested in several years and are concerned about potential pesticide contamination. This is a comprehensive water test and is useful in determining if a treatment system is needed. When you place an order we send you a sampling kit that contains sampling instructions, sampling containers, and all of the necessary paperwork. Once you've filled the bottles according to the instructions and completed the paperwork, you simply put the bottles and paperwork back into the kit and send it off to the lab using your preferred overnight carrier. Radiologicals: The Radiologicals package includes uranium, gross alpha and beta tests and analysis for radon. The Radiologicals Test package includes testing for uranium and gross alpha & beta. Uranium is a naturally occurring element that is considered mildly radioactive. Uranium is present in most soils at a couple of parts per million, but can be much higher in certain rock formations. Uranium is known to cause problems with kidney toxicity and potentially some types of cancer. The EPA has established an MCL of 30 parts per billion for uranium in drinking water. Gross alpha particles emit radiation due to unstable atoms, and include isotopes such as uranium 238, radium 226, radon 222 and thorium 232. The EPA has established an MCL of 15 picocuries (pCi) per liter for gross alpha. Gross beta particles are subatomic particles emitted from radioactive atoms. Beta particles are equivalent to electrons and have a charge of negative one. Some common beta emitters include tritium, cobalt-60, strontium-90 and radium 228. Gross beta is regulated by the EPA at 4 millirems per year. Running a gross alpha and beta test gives you a general idea of the level of radioactivity and can be less expensive than running test for the individual isotopes which contribute to the radiation. Radon is a gas that can accumulate in groundwater. It is a health concern because it can be released into the air and when inhaled is known to cause lung cancer. The EPA does not currently regulate radon in water; although in 1999 they proposed some new standards. First, since radon is of most concern in the air, they proposed two standards which allows water systems greater flexibility in limiting exposure. For systems that have an air mitigation program designed to reduce radon inhalation exposure, they would need to meet an MCL of 4,000 picocuries per liter. For systems with no air mitigation program, they would need to meet a more stringent level of 300 picocuries per liter. Radiologicals Deluxe: The Radiologicals Deluxe package includes uranium, gross alpha and beta tests, additional analysis for radon and adds tests for radium 226 and 228. Radium is a radioactive element which has 25 different isotopes, with only four that occur in nature. Of those naturally occurring isotopes, radium 226 is the most commonly occurring with the others being radium 228, radium 224 and radium 223. Radium 226 is a decay product of uranium 238, so high levels of uranium may be accompanied by higher levels of radium 226. Radium 226 is an alpha emitter while radium 228 is a beta emitter, so testing for alpha & beta is an economical way of screening for these isotopes. A high level of either can trigger the need for further testing. Baterialogicals (available for City Water Kit Only): The Comprehensive Water Test Kit for Well Water includes a test for the presence/absence for Total Coliform and E.Coli. The Comprehensive Water Test Kit for City Water does not as bacterialogicals are not usually an issue for city treated water. However, just in case, if you wish to test for these in your water, you may add the kit to your order. Generally speaking it takes about three weeks from the time you send in your water to the time you receive a report. The reason for this is that there are a lot of factors that go into issuing you a report other than simply analyzing your water. The first step after you have sampled your water and filled out your paperwork is that you must send the sample in to us. If you use an overnight carrier as we strongly urge you to do then that adds only one day to the process. After we receive your sample it must be analyzed. The typical water test takes approximately 10-14 business days. Since the test is complicated it can sometimes take a few days longer. Once the data is complete, a review of the data is done so as to ensure the validity of the data and to find any typographical errors. The data is then electronically sent to our corporate headquarters where the report is generated and undergoes another review process. Finally after the report is approved it is sent to you by first class mail. How do I read this report? When you get your report there will be four main items that you will need to concern yourself with. These items will be prepared in a column format so as to make the review of your test easier. The first item is the name of the analyte being tested, for example lead. The next item will be the maximum contamination level (MCL). The MCL is the limit as set forth by the EPA as the highest allowable amount of that parameter that can be in drinking water. If that column does not have a value for that parameter then there is no set guideline for that parameter (yet). The next item of concern is the detection limit. This is the lowest amount of that particular parameter that the lab will report out. It is strongly emphasized is that there is no such thing as zero in analytical chemistry. A laboratory can only tell you that you have less than the detection limit of any particular parameter. There is not a laboratory in the world that can tell you that you have zero of anything in your water. Finally the last item is your result. This is the amount of that particular parameter that you have in your water. If there is something noteworthy with that value it will be flagged. For example, if you had a value that exceeded the MCL this would be flagged so as to draw your attention to it.